Sherwood is one of the fastest growing and most desirable towns in Oregon. This city’s growth has not squelched the small-town atmosphere of the historic Old Town, and the camaraderie that is evident at community gatherings such as the city's annual Robin Hood Festival. Sherwood is a medley of juxtapositions - the old and the new creating a unique harmony. The protected wetlands of the Tualatin River National Wildlife Refuge and the rolling hills of fertile farmland surround Sherwood's bustling roads and city center. The quiet of Old Town's antique stores and tea shops are only minutes away from new commercial businesses such as the ACT III 10-screen theater, popular local restaurants, the YMCA and the Ice Hus, a double-sheet ice rink. This vitality of oppositions makes Sherwood one of Oregon's most livable cities, providing attractions for all. It is a family-oriented community not far from the down-town city life of Portland Oregon. The community takes great pride in what the area has to offer, including housing, excellent schools and athletic programs. The city is located on Highway 99W, between Tigard and Newberg, an important transportation triangle in south Washington County. Sherwood is also nestled along-side the Willamette Valley’s award-wining wine country. Many agree the proximity is perfect. A short 5 minute drive will get you to Newberg’s old-fashioned “Drive-In” movie theater, 10 minutes to George Fox University, less than 20 minutes and you’re in the City of Portland, 25 minutes to the Portland International Airport and in just over an hour… You can enjoy the beautiful Oregon Coast or snow skiing on Mt. Hood. The location also makes it ideal for professionals who commute to work in Portland and return to live in the quiet of the Sherwood community. 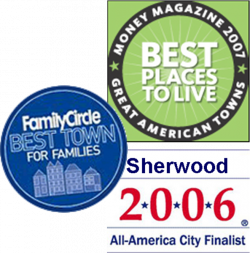 You’ll simply discover Sherwood is a place where you’ll love living!